Wouldn't it be great if your email client could read your mind? You know, sending messages at just the right time. Reminding you when people don't reply to your messages. And taking messages out of your inbox when you don't need them, but returning them to the top of your message pile later on, when you do. Boomerang for Gmail offers all of these features. This free Firefox/Chrome extension can't quite read your mind, but sometimes it feels like the next best thing. Boomerang for Gmail lets you compose messages now and then send them later. Once installed and given permission to access your Gmail or Google Apps email account, Boomerang appears adds a "send later" button on the top of messages you compose, next to Google's own "Send" button. Pressing "Send Later" lets you choose between sending the message at a set interval (in a certain number of hours or days) or at a certain date and time in the future. This feature is handy when you're composing a message at a time when it could get lost in the shuffle, such as over the weekend or during off-hours, and would like to send it at a time when it's more likely to get noticed. Boomerang also adds an option that says "Boomerang this message;" this appears right above your message window. You can choose to "Boomerang" the message--which essentially means have it return to the top of your inbox--in a set number of hours or days, or at a set date and time in the future. This feature is much like the email reminders offered by Followup.cc and Followupthen.com. Those services work with any email service and email client, which is a nice touch for anyone not using Gmail. 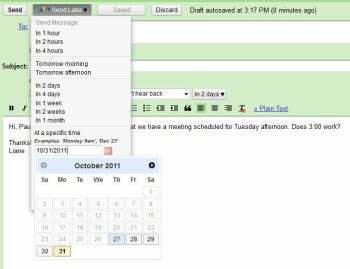 (Baydin does offer another version of Boomerang, called Boomerang for Outlook). Followup.cc and Followupthen.com also require an extra step: You have to send a message to them in order to have your message sent back to you. Boomerang for Gmail simply requires that you click this box, and includes the option to boomerang the message only if no one replies to it--a nice way to be reminded that you're waiting for action. When you open a message, Boomerang also asks if you want to boomerang it back to you inbox at another time. And if the message includes a date--such a proposed meeting time or a due date--Boomerang recognizes this, and suggests returning it to your inbox the day before. Boomerang's Basic version is free, but limits you to 10 messages per month. It does work with both Gmail and Google Apps accounts, though. The $5-per-month Personal version (Gmail only) offers unlimited messages, as does the $15-per-month Professional version, which supports both Gmail and Google Apps accounts, too. If you use Gmail and Firefox, Boomerang for Gmail could quickly become an indispensible tool. I only wish the free version offered a few more messages.